There is no dissemination of technical guidelines Pemira 2015. Students busy to come to the secretariat Sema-U. Wednesday (21/10) last night, the Secretariat of the University Student Senate (Sema-U) suddenly crowded the arrival of a number of students on behalf of the Student Alianasi Justice. They are composed of several representatives of the Faculty Student Senate (Sema-F) demanded clarity about socialization Plenary Meeting to discuss technical guidelines (guidelines) Pemira in 2015 promised Wednesday a week earlier. Sema-U members who happened that night was held a plenary meeting of the follow-up was forced to stop because of the arrival of a number of students Sema-F makes noise. Investigate a investigate, dozens mahsiswa Sema-F which went secretariat Sema-U evening was apparently also requires a plenary meeting of the follow-up. Follow-up meetings were held Sema-U evening by some students Sema-F rated deny the results of the meeting held a week earlier, on Wednesday (14/10). In that held together the Vice Chancellor for Student Affairs, Yusran Razak as well as several other student representatives from the ranks of the already agreed guidelines Pemira 2015 and socialization are given limits up to a week afterwards. Instead of socializing, Sema-U instead hold internal meetings. Chairman Sema Faculty of Social and Political Sciences (Social) Ade Prasetio feel awkward when held internal meetings by Sema-U. Moreover, discussed the guidelines for Pemira 2015. "The problem is felt already completed guidelines as agreed by Warek III at a meeting last week and stayed socialized," he said. However, until Wednesday since the convening of the meeting, there was also no further information. Then, right when the Sema-U to hold a plenary session on Wednesday evening, Ade along with a number of students on behalf of himself as Justice Student Alliance came secretariat Sema-U, in order to clarify the implementation of the plenary session and clumsiness results of the meeting that night. Accounting for up to 200 students come from members of Sema-F and other students. Institutional Commission member Sema-U Gita Syardiana agrees incongruity of the results of the plenary session that he felt a sudden, that changes the result of the guidelines related to the position between Sema-F and Dema-F. In fact, the previous meeting stated that the task of which is owned by Sema-F and Dema-F are aligned. At that time, the option-U Sema chairman stating that the Sema-F are not included in the upcoming Pemira, is also being debated in the courtroom. "If it does not agree Sema-F included, why not protest during the hearing last week," she said, Saturday (24/10). Meanwhile, the masses who packed the secretariat waiting for an explanation from the chairman of the Sema-U. As the night wore no make mass disband. They are still waiting for an internal meeting held suddenly to clarify the results of the plenary session of the Sema-U. Chairman Sema Faculty of Adab and Humanities (FAH) Faiq Alhaq said Student Alliance Justice only want transparency guidelines that have been sealed by Warek III student affairs before. "If the head of Sema-U want to change ya reconfirmation first, let me clear the problem," he said, Saturday (24/10). Finally, after waiting until nearly three hours, Sema-U held an internal meeting with several chief Sema-F and Sema-U representatives authorized. Because not all heads Sema-F are in place Genesis Implementation (TKP) at that time, the Chairman Sema-F which involved only consists of FISIP, FSH, FAH, and FEB. Some results plenum also presented by the chairman of the Sema-U in an internal meeting. Chairman Sema Faculty of Sharia and Law (FSH) Atma Khairul said, there are some who do not agree authority Sema-F participated in Pemira guidelines. "In fact, based on the results of a joint meeting Warek been very clear that the Sema-F come," he said, Wednesday (24/10). On the other hand, the chairman of the Sema-U Eko Siswandanu admitted that he was slow in socialization guidelines Pemira 2015. This was because of a meeting held Warek III student affairs only discuss the draft guidelines is not the duty or authority Sema-F and Dema-F in detail. "We (Sema-U) refine the results warek meeting in plenary session is," he said, Saturday (24/10). 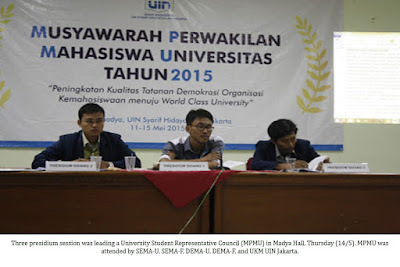 Sema-U plenary session, which discusses Pemira 2015, continued Eko, not merely want to change the results were sealed Warek III student. However, Eko intended to clarify guidelines and Dema Sema-F-F in selecting KPU and Banwaslu. Therefore, there should be an internal meeting Sema-U. "It Dema-F and Sema-F was parallel but both have different tasks as well as the legislative and the executive," he said. Responding to the chaos in front of the secretariat Sema-U, vice chancellor of student affairs Conan Rozak say this is just a matter of socialization are not comprehensive. "We have discussed in previous meetings. The point Sema-F and Dema-F involved in Pemira, "he concluded, Friday (23/10).